How To Help Your Reflux Baby Sleep. Sleep tips for reflux babies. Get your reflux baby sleep as well as possible. I had grand plans with my second baby. I hadn’t started Babywise with my first baby until he was 9 weeks old. I was so grateful we had started it at all. Once we did, sleep immediately improved. While starting late still worked out in the end, I really wanted to get to those long naps and sleeping through the night sooner with my second baby. I knew with two babies under two I would really need solid sleep. We were starting from the beginning and sleep was going to be perfect. Of course life has a way of changing your plans. When my daughter was born, she was whisked away to the NICU before she ever made it to my room. While in the NICU, an amazing nurse observed that Kaitlyn had reflux. Of course the silver lining was that I knew from before she ever came home from the hospital that she had reflux. We didn’t spend days or weeks as many reflux families do trying to troubleshoot sleep before realizing that the problem with sleep was reflux. The dark cloud, however, is that she had reflux. Reflux babies just do not sleep as well as they would otherwise if they did not have reflux. That meant my well-laid plans of great sleep early on were sure to be disrupted. Despite the reflux, Kaitlyn was able to grow to be a great sleeper. It took more time than it would have without the reflux, but sleep is still possible with your reflux baby. 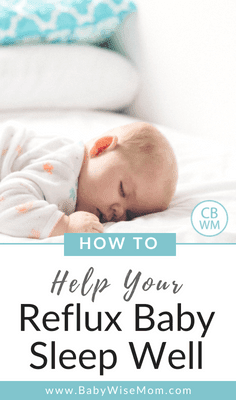 Here are my tips for getting your reflux baby to sleep. Your child having reflux does not mean your baby will not be able to sleep well. When you have your baby eat, then play, then sleep, you give your baby time to digest food some during playtime before lying down to sleep. This means the position of sleep will not cause as much pain for your baby. So following the Babywise eat/wake/sleep cycle will naturally help your baby to be able to sleep better even with the reflux. During this playtime during your eat/play/sleep pattern, be sure to have baby propped up as much as possible. You want as much up and as little horizontal as possible during playtime so when sleep happens, your baby hasn’t already spent time getting the acid creeping up. When you have a reflux baby, you really need to adjust your hopes and expectations. Your baby with reflux will not take as long of naps as she would if she didn’t have reflux. She will not sleep through the night at as young of an age as she would otherwise. Have patience and know sleep milestones will be delayed. The can come! Kaitlyn reached her long naps and sleeping through the night later than her younger sisters without reflux did, but still months earlier than her older brother who started Babywise late did. 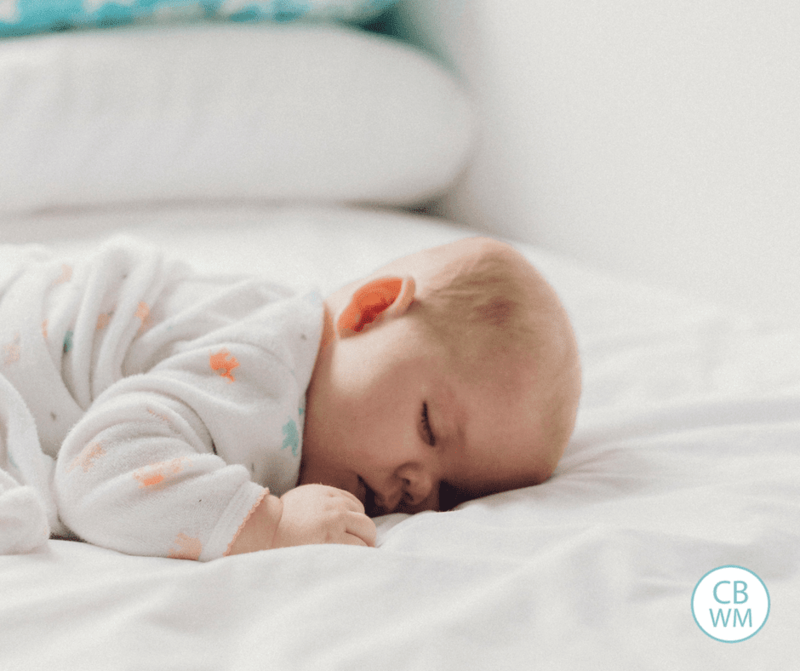 While your reflux baby won’t sleep as well as the average Babywise baby at the same age, she will sleep better than most reflux babies out there. One day when I was feeling sorry for myself and the lack of sleep, I found a reflux support group and found Kaitlyn was sleeping a million times better than the other babies out there. Yes, she woke in the night, but she woke in her own crib. Most other moms were sleeping holding their baby upright in a recliner all night every night. Really speak up for your baby with your baby’s doctor. Research and know common practices for treating reflux and bring those options up with your pediatrician. If you feel like your baby needs something specific, push for it. I am typically all for little to no sleep props. Start as you mean to go on. Do not start something you don’t want happening every day. However, sometimes things interfere with sleep, and getting sleep is the most important thing. Reflux causes pain. It is hard to sleep when you are in pain. For a reflux baby, something you may view as a prop, such as a swing, can really be an aid. The swing allows baby to be propped up to sleep, which can mean less acid creeping up, which means better sleep. Kaitlyn regularly slept in the swing until she was 7 months old. It has never interfered with her ability to sleep. She is probably my most solid and deepest sleeper overall as I write this and she is age 11. Read more about my Sleep Hierarchy here. You can read about When Sleep Props are Okay and When to Avoid them here. Get your baby swing here (affiliate link). If your baby is on medication, monitor the dosage closely. Many of the medications are based on weight, so after a growth spurt, your baby may need the dosage increased. Know the best practices with the medicine. When should the medicine be given? Many work best if given 30 minutes before feeding. Would the dosage be better given multiple times a day? You may be giving it once a day when it would work better for your baby to do half in the morning and half at night. Also, be aware of the various options for medications. Some work great initially but the effectiveness wears off. The type the doctor decided to have your baby try might not be effective for her. Take notes and continue to be an advocate for your baby. Gripe water is amazing for relieving pain for your baby. Get your gripe water here (affiliate link. This is my favorite brand). Certain foods may cause your baby’s reflux to get worse. Just like certain foods cause your heartburn to flare, so can foods for your baby. Take note of foods that irritate your baby. Chocolate, caffeine, citrus foods, and tomatoes. Your baby will likely need to eat more often for a longer period of time than a baby without reflux. Do not stress if your baby does not move to a 3.5 or 4 hour schedule when you expect her to. She may not move to a longer schedule until months later than the average baby. With all that I have said in this post about being patient and knowing milestones are delayed with a reflux baby, you also want to have caution to not let reflux become an excuse. Do not let poor sleep habits develop because of the reflux. Yes, your baby will take longer to reach milestones. Yes, your baby will take short naps more often. Yes, your baby will need some sleep props at times. But your baby is still a baby who needs to learn the sleep skills. This is a fine balance of a reflux parent. It isn’t easy and can take some trial and error to know when it is a reflux issue and when it is a sleep issue. Having a baby with reflux is not easy. Even so, your reflux baby can be a great sleeper. You can develop healthy sleep habits and help your reflux baby be well rested and as content as is possible. You will need some patience. You will need to be watchful and diligent, but sleep will come.